Natural turquoise dangle charm stretch bracelet. Natural stone varies in shape, size, or color. 8mm pewter Navajo Pearl stretch bracelet. 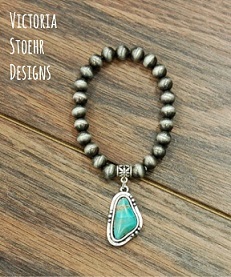 1.2 inch long natural turquoise charm.